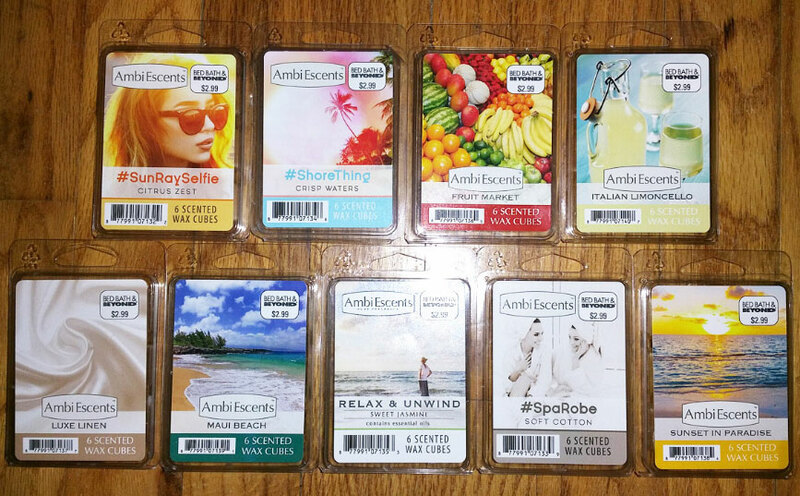 Read reviews of AmbiEscents Wax Melts from Bed Bath & Beyond (January 2018). I loved most of the scents in this lot, although around half of them are dupes of ScentSationals scents. This is the same scent as ScentSationals Hello Sunshine from last year. It's a fantastic bright citrus scent of grapefruit, orange, and maybe a little bit of lemon. If you loved last year's ScentSationals Tahiti Shores scent and are disappointed that it's been discontinued, no need to fret... This is the same scent! It's a fantastic, bright sweet watery scent with a cologne note, a little clean soapiness, a hint of pepper, and a smidgen of tropical fruit. This one is weak on cold sniff. I smell a lot of different types of fruits on cold sniff: strawberry, melon, orange, maybe a little tropical. It's not as sweet as other similar sounding scents, but it also doesn't have that sour note that some tropical scents have. Melted, I smell fruit and coconut, although the coconut might just be some combination of the fruits. The main fruit I smell when melting is the melon I think. Looking at the notes, no coconut. It's an okay scent. I love this scent! It's limey and lemony with a lemongrass note, and a little bit salty and just a smidgen of sweetness but actually not very sweet at all. It almost has a bit of a spa quality due to the lemongrass note. This is the same scent as ScentSationals Egyptian Cotton from January 2016. This is basically a toned down version of ScentSationals Vintage Lace (one of my favorite scents, and it smells a lot like White Shoulders perfume). It's a lovely warm cashmere (a light sweet fabric-y amber scent) mixed with old-fashioned white musk. It's not a laundry scent, as there's no harshness and no clean detergent notes, but perhaps a slight fabric softener note. It smells like ScentSationals Vintage Lace mixed with a little bit of ScentSationals Crisp Linens to temper the sweetness. This is the same scent as ScentSationals Calypso Sands, a fantastic sweet watery scent with honeydew, vanilla, and a hint of coconut. I'm sniffing them side by side, and if they're not the same scent, they sure are close. Maui Beach is slightly richer, but then, my pack of Calypso Sands is a few years old. The only reason I think it might not be the same scent is that when they use dupes, they usually use the same or similar colored wax, which is not the case here. Calypso Sands is a light beige color, and Maui Beach is turquoise. This is the same scent as ScentSationals Sweet Dreams (Sweet Jasmine) Fusion from May 2017. This scent's name is a misnomer. There is no jasmine or even floral in this scent, and it's not very sweet. I can't even figure out what it smells like, maybe a bitter soapy scent? Melted, it definitely smells like soap, like an intense natural soap with a hint of citronella, or an industrial soap, or even unscented Ivory soap. It says it contains essential oils, so maybe that's why I don't really smell the sweet floral. I don't care for this one. A nice subtle cotton scent, sort of like fabric softener or a sachet, with maybe a smidgen of musk and baby powder, but it's just slightly sweet. There might be a barely detectable smidgen of light wood way in the background. It's nice and relaxing and perfect for a bedroom or baby's room. Fantastic slightly perfumey pineapple scent with maybe a sweet vanilla note, and candy note, and a little bit of honeysuckle, and there might be some other kind of fruit in there as well. I'm not a fan of pineapple scents, but this one is heavenly, and my favorite of all the new AmbiEscents scents! There's a new ScentSationals scent that just came out called Honeysuckle Pineapple. This is NOT that scent at all; that one to me smells like straight pineapple. This scent, however, is a super sweet candy-like perfumey pineapple.